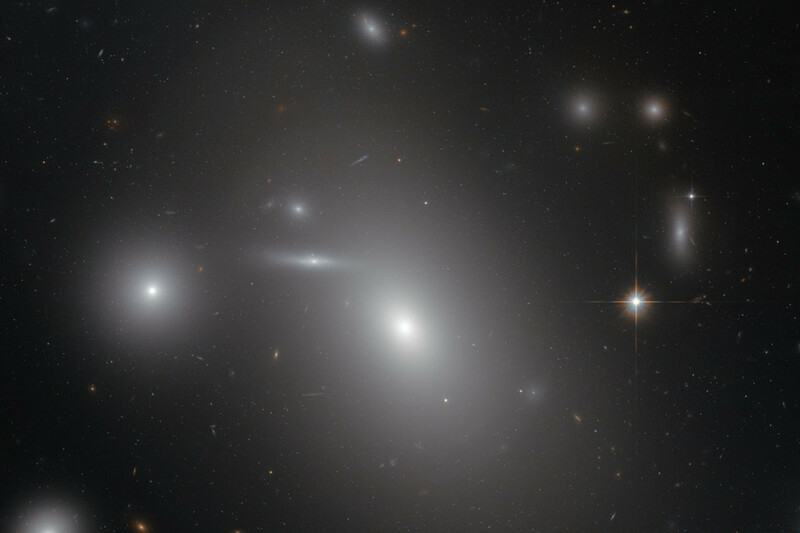 February 11, 2016 – Located about 300 million light-years away in the Coma Cluster, the giant elliptical galaxy NGC 4889, the brightest and largest galaxy in this image, is home to a record-breaking supermassive black hole. Twenty-one billion times the mass of the Sun, this black hole has an event horizon — the surface at which even light cannot escape its gravitational grasp — with a diameter of approximately 130 billion kilometers. This is about 15 times the diameter of Neptune’s orbit from the Sun. By comparison, the supermassive black hole at the center of our galaxy, the Milky Way, is believed to have a mass about four million times that of the Sun and an event horizon just one fifth the orbit of Mercury. But the time when NGC 4889’s black hole was swallowing stars and devouring dust is past. Astronomers believe that the gigantic black hole has stopped feeding, and is currently resting after feasting on NGC 4889’s cosmic cuisine. The environment within the galaxy is now so peaceful that stars are forming from its remaining gas and orbiting undisturbed around the black hole. When it was active, NGC 4889’s supermassive black hole was fueled by the process of hot accretion. When galactic material — such as gas, dust and other debris — slowly fell inwards towards the black hole, it accumulated and formed an accretion disk. Orbiting the black hole, this spinning disk of material was accelerated by the black hole’s immense gravitational pull and heated to millions of degrees. This heated material also expelled gigantic and very energetic jets. During its active period, astronomers would have classified NGC 4889 as a quasar and the disk around the supermassive black hole would have emitted up to a thousand times the energy output of the Milky Way. The accretion disk sustained the supermassive black hole’s appetite until the nearby supply of galactic material was exhausted. Now, napping quietly as it waits for its next celestial snack, the supermassive black hole is dormant. However its existence allows astronomers to further their knowledge of how and where quasars, these still mysterious and elusive objects, formed in the early days of the Universe. Although it is impossible to directly observe a black hole — as light cannot escape its gravitational pull — its mass can be indirectly determined. 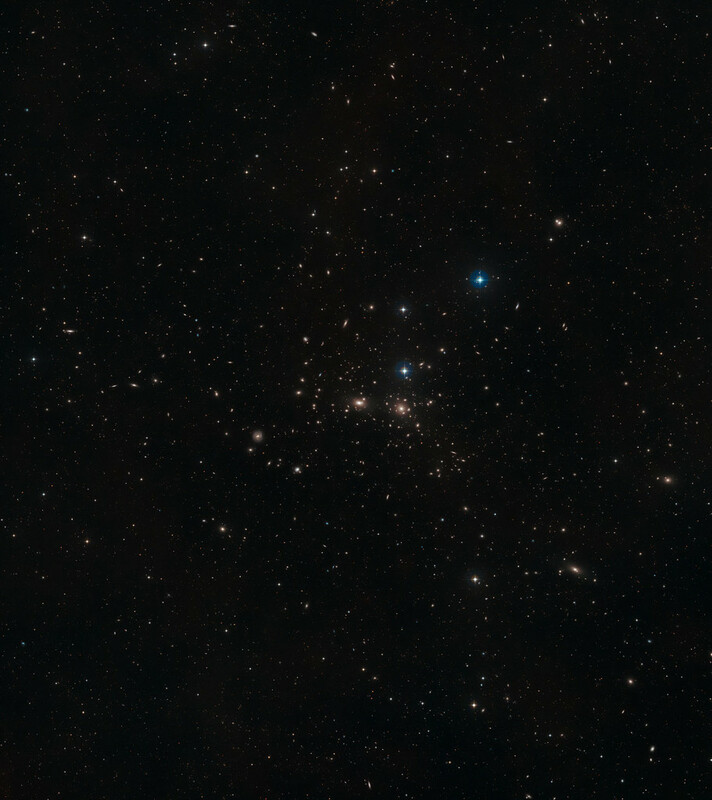 Using instruments on the Keck II Observatory and Gemini North Telescope, astronomers measured the velocity of the stars moving around NGC 4889’s centre. These velocities — which depend on the mass of the object they orbit — revealed the immense mass of the supermassive black hole.